Microsoft has pushed out an update to Windows users that forces applications and web services using RSA encryption to have keys of at least 1024 bits in length. The update was previously available through the Download Center but was shifted to Windows Update on Tuesday, as Microsoft had previously warned. It ensures that signed apps and services such as encrypted email, which use RSA keys and call into the CertGetCertificateChain function, will no longer trust certificates with shorter keys. The reason for extending key length is to reduce the likelihood of the keys being cracked through brute force methods. “This is the final step in our move to help folks strengthen their certificates by requiring them to have an RSA key length of at least 1024 bits,” Dustin Childs of Microsoft’s Trustworthy Computing group wrote in a blog post on Tuesday. Most apps and services should no longer require such prodding. Security experts have for more than five years been calling for businesses to move past 1024-bit encryption, and the US National Institute of Standards and Technology (NIST) recommended widespread adoption (PDF) of 2048-bit encryption back in January 2011. The key-length change was not the only update pushed out by Microsoft in its Patch Tuesday bulletin. A critical update (MS12-064) tackles a remote code execution flaw in Word, while others resolve issues in Windows, SQL Server, SharePoint, Lync and the nearly-defunct Microsoft Works, which will cease to be supported as of the end of this week. Windows update spells end for short RSA keys for encryption | ZDNet via Windows update spells end for short RSA keys for encryption | ZDNet. The Spanish banking giant Santander has downplayed growing concerns over its alleged inclusion of “sensitive data” in its cookies. The bank did not deny including personal data in cookies. In a post on widely read security mailing list Full Disclosure, an anonymous contributor details a number of alleged problems on Santander UK’s consumer eBanking site. He claims that Santander online banking “unnecessarily stores sensitive information within cookies”. Depending on which areas of online banking the customer uses, he claims this data allegedly includes the user’s name, PAN (credit card number), bank account number and sort code, Alias and UserID. “Of particular concern is the full PAN, which PCI DSS states should be rendered unreadable anywhere it is stored,” the whistleblower stated. He adds that he had gone public after experiencing problems getting the bank to play attention to (now fixed) cross-site scripting problems he had previously unearthed on its website. Santander issued a statement strongly denying allegations that anything was amiss. It said that data stored in its cookies posed no risk to account security. The data items stored within our cookies, if compromised, would not allow access to our online services on their own and our primary login processes do not rely on cookie data.We review the use of our cookies and the data contained within them, and if necessary will review the IDs used by our customers to limit any future risks. 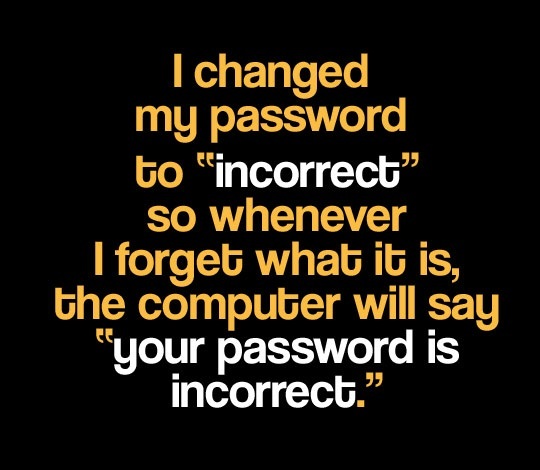 We take the security of our customer data very seriously. Customers can change their IDs at any time themselves and are reminded not to use the ‘remember me’ function on public or shared computers. Apple has enabled user tracking of its customers once again, with the recently released iOS 6 enabling advertisers to see which apps users have run, and which adverts they’ve seen – all for the benefit of the users, of course. The feature wasn’t highlighted by Apple at the launch of iOS 6, as Business Insider points out in its detailed rundown, but the new tracking number is important as it enables advertisers to target users, and provides decent enough obfuscation to make switching it off really quite difficult, though those making use of it would question why one would want to turn it off anyway. UDIDs weren’t just used by advertisers, they also allowed apps to download settings when reinstalled into a device where it had previously been used (assuming the vendor kept records), and enabled analytical software (such as Crashlytics) to identify when different applications are crashing on the same device – pointing to faulty hardware – something impossible with alternative schemes. Apple’s new IFA isn’t guaranteed not to change – the device could generate a new random number at any time, but Cupertino isn’t saying how often, or if, it will. But that shouldn’t matter to advertisers who don’t care if it’s not perfect. More importantly the IFA can be switched off by users, or (more accurately) one can switch the “opt out” option to “on”, assuming one can find it under Settings/General/About/Advertising, not “Privacy” where one might expect to find it – Business Insider has a step-by-step guide with pictures. While we’re on the subject, Bruce Schneier reminds us that last month Apple posted details of how toopt out of its own advertising platform iAd, or the tracking performed by iAd at least, one has to keep watching the ads as long as one wants free stuff. Which brings us to the question of why one would bother. We’re told that tracking is used to present adverts in which we might be interested, and ensure that the same adverts aren’t presented repeatedly everywhere we go, but that might not be as true as one would hope if Google is any guide. Some months ago your correspondent expressed some interest in a Fluke Thermal Imager, from a technical point of view, and since then at least half the websites visited have shown the same advert for Fluke, which eventually phoned to ask if I was going to buy one. I’m not – I have an interest, but no use, for such a thing – but still I’m unable to avoid the adverts everywhere. 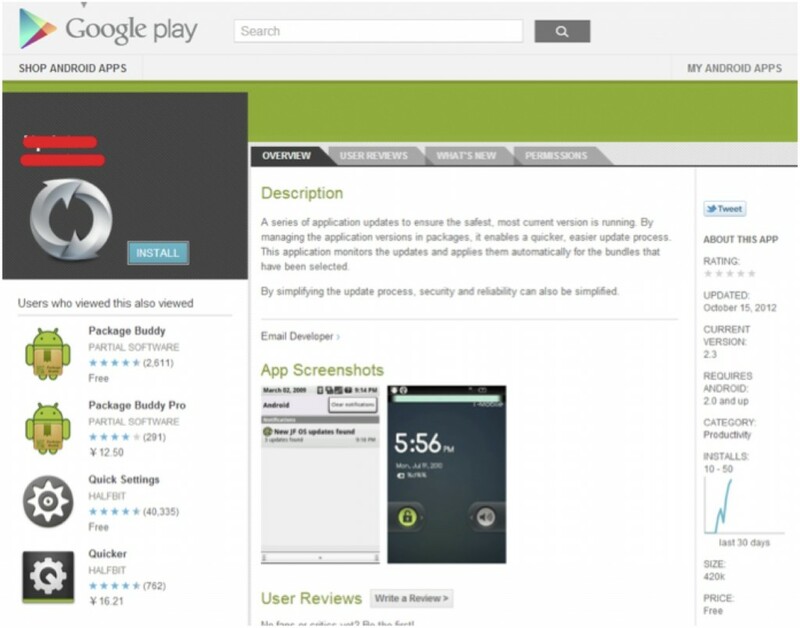 On Oct 17th 2012, TrustGo Security Labs uncovered a new malware on Google Play, named Trojan!FakeLookout.A. This malware hides itself in the full Application List after installation. It only shows up in the Downloaded app list where it uses Lookout’s icon and the name “Updates”. This malware can receive and execute commands from remote server. According to remote server’s commands, the malware can steal user’s SMS messages and MMS messagesand upload them to remote server via secure FTP. 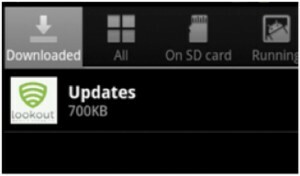 It will also upload the complete file list from the user’s SD card to the remote server. 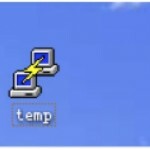 Then remote server will control the malware to upload specific files. This is a severe threat to user’s privacy and sensitive data. TrustGo Security Labs successfully accessed the FTP server and discovered uploaded files from some victims. 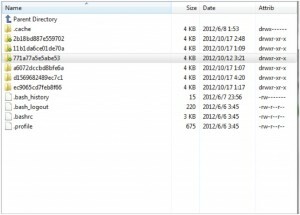 The following is the root directory of the FTP server. 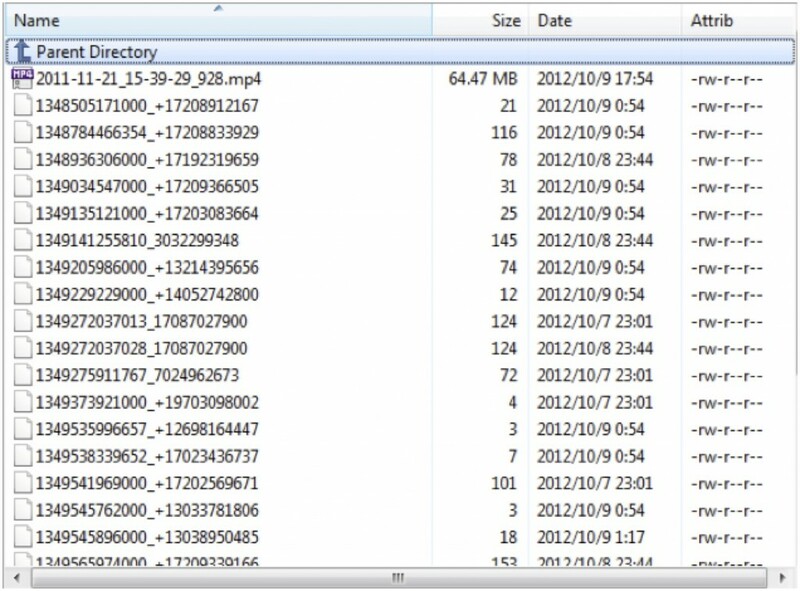 Upon exploring the directories, TrustGo Security Labs found a variety of SMS messages and video files from victims. Based on the static analysis of code and the evidence found on the server, TrustGo positively identified the app as containing malware. Based on IP address, the server is located in Colorado in the United States. Further investigation shows remote server hosts a malicious website! 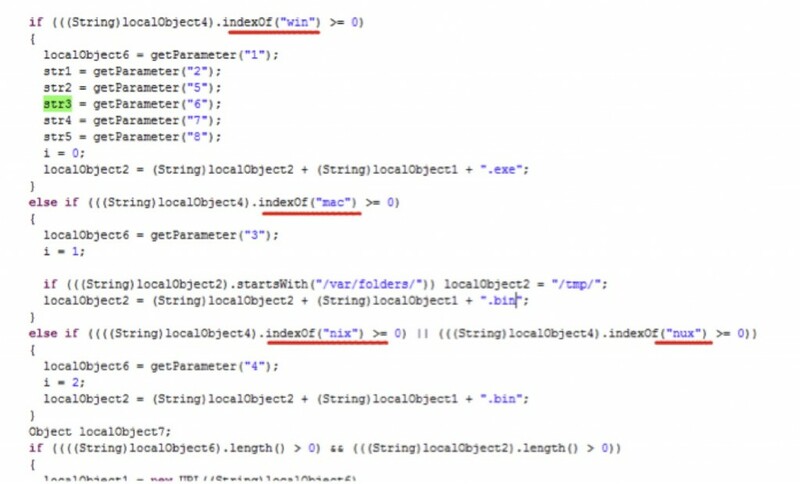 It dropped a backdoor Trojan file (Figure 5) and runs shell code in Windows Powershell. Once the Trojan opens a backdoor, it waits for further commands. The malicious website is targeting multiple platforms including Windows, Mac and Unix/Linux operating systems (see figure 6). It will drop different Trojan files depending on the user’s operating system. The hacker is attacking multiple platforms including Windows, Mac, Unix/Linux operating system and Android. The Android malware found on Google Play is just a part of the attack.